Is there any story more sacred to geekdom than the Star Wars saga? If you always secretly wanted to be Luke or Princess Leia, have we got a piece of upcycled art for you. Etsy artist Gabriel Dishaw knows what it feels like to spend childhood longing for a light saber, so it’s no surprise that his passion for Star Wars would carry over into his adult life. He likes to make artistic items from upcycled materials; bits and pieces of things that might otherwise have been thrown away. 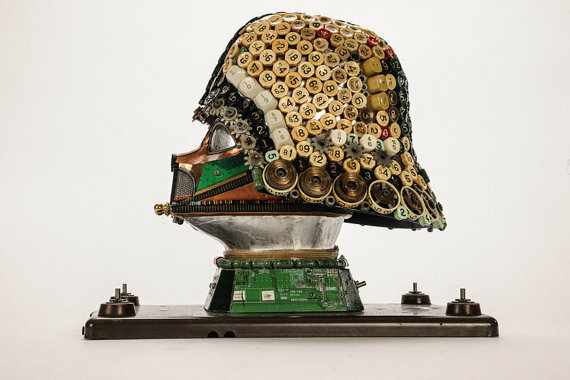 Most recently, he turned found objects from typewriters, adding machines and old computers, into a Darth Vader helmet that has our midichlorians all aflutter. Well, if you’re lucky enough to bring home this Darth Vader mask, there’s no doubt it will be a conversation starter. Even though Dishaw works only with found materials, it’s hard to deny the spot-on recreation of the omnipotent Sith Lord’s iconic head gear. Numerical buttons from typwriters and old calculation machines form the crown of the villan’s helmet, while brass and copper finishings, and circuit boards complete the sculpture. 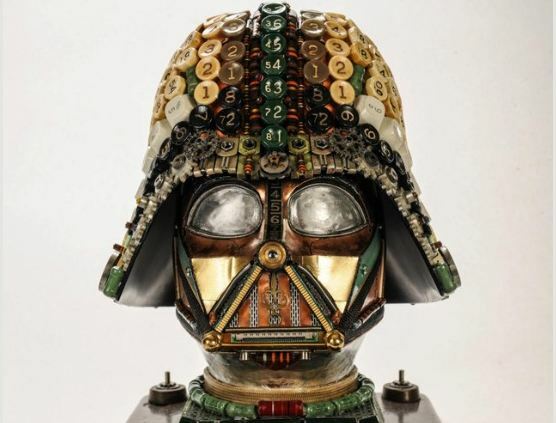 The Vader mask is listed at a heart-stopping $800, but there are lots of other cool upcycled creations in Dishaw’s Etsy shop if that’s too rich for your blood.